The Kingdom of God is all about risk. 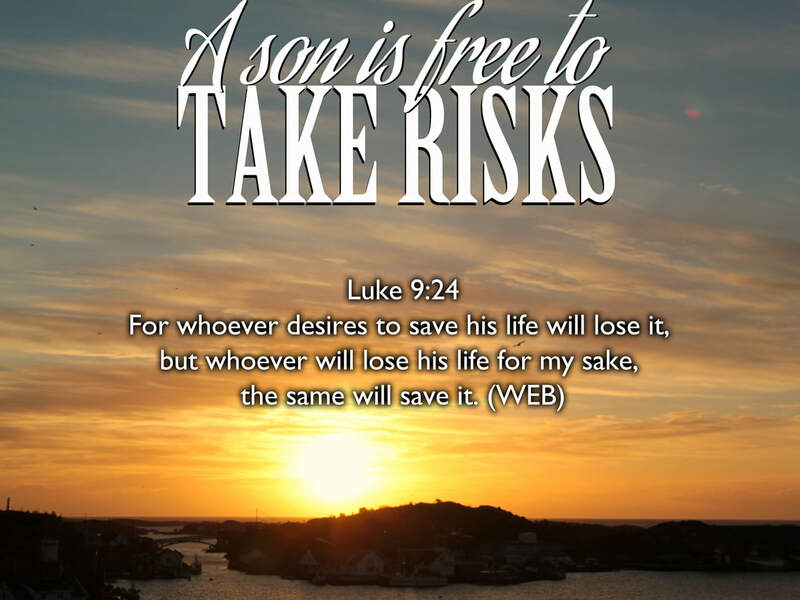 Jesus told us that if we want to play it safe and 'save our life', we will end up losing it. But whoever jumps in head-first into the plan and purposes of God will truly find their life. In the Parable of the talents (Matthew 25:14-30), we read a story where one servant risked five talents to get another five. One risked three talents to get another three and one was too afraid to risk the one talent so he buried it in the ground. When the Lord came to check on his investments, the one servant who buried his talent responded by saying in verse 25... I was afraid, and went away and hid your talent in the earth. Behold, you have what is yours.’ (WEB) His motivation for not risking the one talent he had was not faith-based, but fear-based. He was afraid of losing the little he had, so he did nothing with what was entrusted to him. I truly believe that our God and Father loves it when we take risks. I don't mean taking risks for risk sake, but when we feel in our heart to do something bigger than is humanly possible and we do it despite our own feelings of inadequacy. I believe that facing our fears and risking failure is the definition of true courage and the only way that we will accomplish things that are 'exceedingly abundantly above all that we ask or think' (Ephesians 3:21). I believe that a son who is secure in who he is, is free to live a life where he is wiling to take risks to go higher and farther into the 'good works which God had prepared in advance for him to do' (Ephesians 2:10). A son who knows that he is loved, can be willing to stumble and fall at times because he knows his value to the Father is not based on what he does... or the mistakes he makes along the way. In the orphan world that we live in, failure is devastating. Failure is shame-based because it is linked to our own self-image and the image that other people have of us. The fear of making a mistake causes many dear people to live a life of imprisonment of their own making. Instead of boldly proclaiming like David did in Psalm 27:1... Yahweh is my light and my salvation. Whom shall I fear? Yahweh is the strength of my life. Of whom shall I be afraid? (WEB) People who live in fear of failure say... I was afraid, and went away and hid your talent in the earth. The fear of man is also a big motivator for us to not risk. What will other people think if I do this? What if it does not work out? Then what will my reputation be? Can you imagine what Noah had to face on a daily basis when he began to build the ark that called God told him to build? Could you imagine over 100 years of daily ridicule from his community? It took great risk for Noah to do what he did, but as we know from the story, there was a great reward for his willingness to simply obey God. The desire of my own heart is that I would be faithful with the single talent that I have been entrusted with. Perhaps by perseverance and the ability to risk, that one talent might multiply to two and maybe the two might multiply to four? I don't think that the number of talents that we have been entrusted with is the thing that impresses God, but our willingness to risk what we have. The thing about risking is that there is no guarantee that we will be successful. We all love a success story, but for each success there are probably many more failures that we don't want to talk about. On a personal note, I have had many more failures in my own attempts at risking than I have had successes. And every time I feel Papa wants me to risk again, the memory of past failures are always there to discourage me. It is no surprise that the average self-made millionaire has a number of business failures before they actually find success. I think the reason for this is simply because they were not afraid to risk and fail. And when they failed, they got up on their feet and were willing to risk again. When our children were little, they loved jumping off the stairs into my arms. They loved the adventure of risking because they were confident that their dad would catch them. The thing that amazed me as their father, was their willingness to risk and trust that I would catch them. At the end of the day, I don't think it is our success that will touch our Father's heart, but our willingness to face the fear of failing and dare to go out on a limb again and again. In Psalm 37:23-24, David says... 23 A man’s goings are established by Yahweh. He delights in his way. 24 Though he stumble, he shall not fall, for Yahweh holds him up with his hand. (WEB) Even though we may stumble and fall at times, we can take great comfort in knowing that the Lord will catch us in His hand. My prayer today is that each one of us would know that our value to our Father is not based on our performance, but is based on the eternal truth that He loves us with an everlasting love. May the love that God has for us bring us to a place of complete security and rest knowing that nothing in all creation will ever separate us from His love and acceptance (Romans 8:35-39). I also pray that the security of knowing our value to Him will give us the courage to risk obeying Him when He calls us to risk. I also pray that the paralysis that would keep us from simply obeying God and risking would be consumed in the fire of His love for us. May each one of us be encouraged today by the love that our Father has for us so that we can fulfill His plans and purposes for our lives without fear of failure.